Movement Matters ... random thoughts on movement while on vacation. I'm on vacation on lovely Hilton Head Island. It's so beautiful - the weather is perfect and I can hear the ocean waves crashing in the distance from my condo. While here I'm doing a lot of walking - on the beach, around the resort, just everywhere. I haven't explored the walk to town yet but that may be on tap for today. The closest store is about 1.5 miles - perfect for a nice walk! Earlier in the week we had breakfast at a new French Bakery - just yum! We grabbed a few goodies to bring back to the condo with us - goodies that included two beautiful apricot scones. But for me, scones definitely need a side of clotted, Devonshire or just plain whipped cream. I had purchased some heavy cream for my morning coffee but the condo doesn't have a mixer. What's a girl to do? Go figure- before the days of electricity, people churned their own butter and whipped their heavy cream... BY HAND! Did you know you can do that? I did it! The whisk made it pretty easy, actually, and pretty fast. 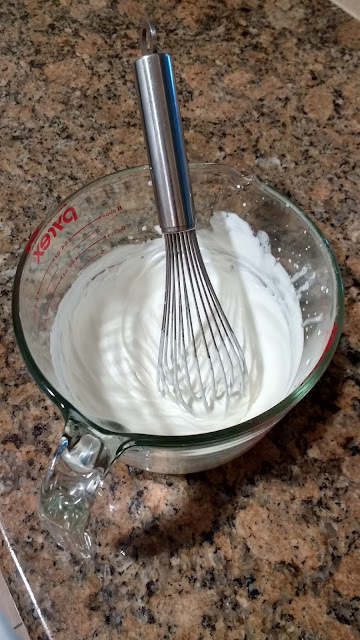 In the time it would have taken me to pull out the mixer and attach the beaters at home, I had luscious creamy whipped cream and a bit of a sore arm! So my challenges for this in the future are to keep going when my arm gets tired (surprisingly quickly ... I should make whipped cream more often!) and to remember to switch to my left hand too. The left-hand thing - wow... it's amazing how totally uncoordinated I am doing these kinds of things with my left hand. So, my challenge now will be to START with my left hand and switch back to my right hand if/when I need to. What does this have to do with feet? Everything, actually. If you've taken the time to listen to Katy Bowman's podcasts about her new book, Movement Matters (available now! Click to get your copy on Amazon), you'll quickly make the connection (I hope). This book promises to be mind blowing. I'm so excited to get home and start reading it since it was delivered yesterday while I am away. But the podcast will give you a good taste of and be a good primer for what you'll be in for with this book. And, like me, you'll quickly click over to your favorite retail site to secure your copy. Then, after you do that, go for a walk, forage for some food, or whip up some whip cream - by hand! Buy Movement Matters on Amazon by clicking here. Listen to Katy's Podcasts by clicking here.